All catheter caps and connections, medications poet and peritoneal dialysis set disinfection. High level disinfectant, fast acting, active against bacteria, fungi, spores, mycobacteria and viruses. Can be used with all catheters and connectors currently on the market. Staff member should wash hands and comply with clinic PPE. Patient should don a face mask. A sterile underpad should be placed under the catheter. On a chux sheet, carefully open both packages of 4x4 gauze pads keeping pads on sterile wrappers. Saturate both sets of 4x4 gauze pads with ample amounts of Alcavis 50 (8 - 12 ml). Put on clean, non sterile gloves. Carefully place the catheter venous port in an Alcavis 50 saturated 4x4 gauze pad and scrub the catheter end and port for 1 minute. catheter end and port for 1 minute. Make sure to rub in an agitating motion when cleaning ports. Carefully wrap the arterial port in an Alcavis 50 saturated gauze pad. Carefully wrap the venous port in an Alcavis 50 saturated gauze pad. Leave each port wrapped for at least 1 minute. Carefully unwrap the catheter ports for initiation of dialysis treatment per clinic protocol. Place plastic clamp on the peritoneal catheter. Staff member should wash hands and don appropriate PPE. Patient should don a face mask. 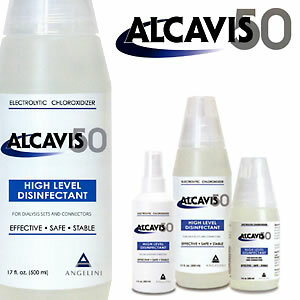 Open lid of sterile cup and fill with 100 ml's of Alcavis 50. Open all packages of sterile 4x4's. Saturate gauze pads with ample amounts of Alcavis 50 (8 - 12 ml/gauze pack). Have patient pick up catheter and transfer set. Nurse should place the sterile drape under the catheter-transfer set connection. Patient should drop catheter onto sterile field. Open new transfer set and minicap and maintain sterility. Pick up first set of 4x4's saturated with Alcavis 50 and scrub the connection between transfer set and patient catheter maintaining contact for one minute. Next refer to Option 1 or Option 2 below. Option 1 Using the second set of 4x4's saturated with Alcavis 50, wrap the connection ensuring contact for one minute. Carefully twist and separate transfer set from catheter. Option 2 Using dry sterile 4x4's , carefully twist and separate the connection and drop the patient catheter end into the sterile cup filled with Alcavis 50. Submerge catheter end completely for one minute. Replace sterile gloves if cup exterior is not sterile. Pick up new transfer set, maintaining sterility, and apply new transfer set to catheter. Make sure the connection is tight. Staff member should wash hands and comply with clinic PPE. Saturate 2x2 gauze pads with ample amounts of Alcavis 50 (3 - 5 ml). Aseptically place Alcavis 50 saturated 2x2 gauze pads on port to be disinfected. Leave gauze pads on port for 2 minutes. Remove gauze pads and continue according to clinic protocol. 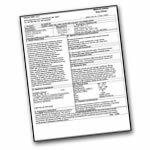 Alcavis 50 Material Safety Data Sheets (MSDS) include information concerning; Generic Product Identification, Health hazard data, Hazardous ingredients, Preparation Information, Special protection and precautions, spill or leak procedures, Fire and explosion data, Physical data and Disposal considerations.